The Zenbook Pro 15 wasn't the only dual-screen device on the docket for ASUS' Computex 2018 press conference, the company also teased another new device called Project Precog. According to ASUS, "artificial intelligence and machine learning are changing the face of computing, providing new frameworks for evolved user experiences." 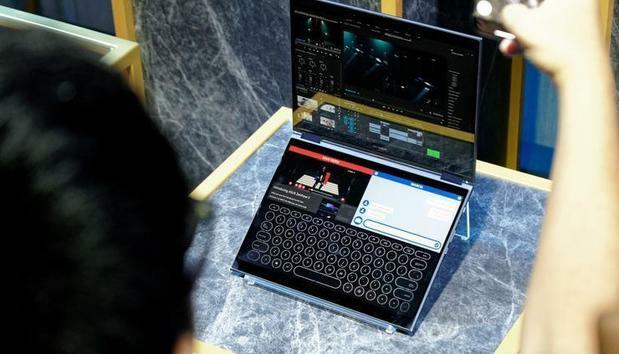 "ASUS is embracing this revolution — and demonstrating just how far-reaching its effects will be —by creating the first convertible dual-screen laptop with fully enhanced AI features. Project Precog is just the start of AI PC innovation from ASUS: you can expect the continued evolution of ASUS AI PCs, with even more incredible features, in the very near future." Essentially, it's a 2-in-1 with a dual-screen rather than any sort of physical keyboard. Like a traditional convertible, Project Precog can be setup in notebook mode, tent mode, book mode or flat mode. There's no word yet on any specs - both within the guts of the device or the display - nor a potential pricepoint. As for whether the lack of a physical keyboard will be worth the extra display space, ASUS say that a new AI-driven feature called Intelligent Touch will make up the difference here. "Intelligent Touch automatically recognizes the input device you’re using and changes the virtual interface accordingly. It can automatically adjust the keyboard location depending on where you place your fingertips, or automatically switch to stylus mode when a stylus touches the lower screen." ASUS also say that Project Precog will also comes fully integrated with both Microsoft's Cortana and Amazon's Alexa voice assistants. ASUS say that a consumer-ready version of the device will make its way to market in 2019.